And what a view it is! 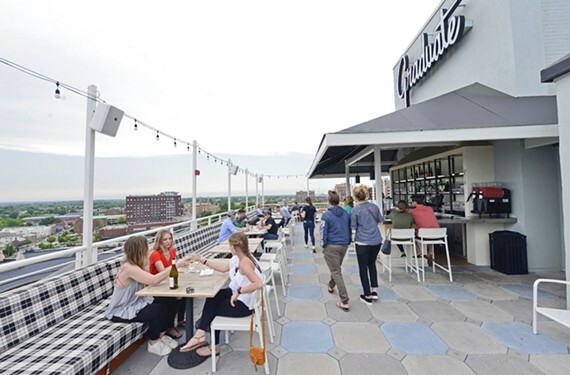 There's no better perch than the Byrd House — aka the Graduate's rooftop bar — to check out stunning views of the Jefferson and its towers from 16 floors up and only a block away. From the Federal Reserve building gleaming in a pre-sunset glow to a primo look down on the Manchester Bridge, there's a lot to like about the latest addition to Richmond's ever-growing list of lofty places to raise a glass. With a handsome bar situated in the center of the roof, the remainder of the space is given over to inviting banquettes with thick, plaid cushions, simple white chairs and casual wooden tables. Lights strung up on all sides provide after-dark ambiance surrounded by city lights and the occasional hovering helicopter. A rooftop pool adjacent to the Byrd House only adds to the unexpected charm of the newest Monroe Ward bar. For a symbolic view of Richmond then and now, look northwest from the rooftop and you'll spot a seldom-seen view of the backside of the stylish Institute for Contemporary Art and barely two blocks away, the distinctive white double porches of a typical 19th century Richmond row house. Old and new views are just part of the appeal of sipping on high at the Graduate.